I love packing; yes, that tedious task of trying to fit everything into a bag for a trip brings me excitement. I like it so much, I pack weeks before my scheduled trip. I love to go through the entire rituals of figuring out my OOTD for each day of my trip, selecting the clothes from my wardrobe, putting them all in my bag or luggage, and watching how I’ve made a mess of things when I couldn’t fit my stuff in there. Okay, to be honest, this is the one part of packing that I loathe. Even as a frequent traveler, I still haven’t learned the art of packing light (or maybe I refuse to get it in my system because you know, girls must have/bring things!). So what’s a girl to do? Well, a girl has a few tricks up her sleeves, one of them is using packing cubes for traveling. And because there are many in the market, let’s talk about what I got, the packing cubes from Bagail.com. Bagail.com is an online shop that offers an array of travel bag, shoe bag, laundry bag, men’s bag, women’s bag, and gym bag. It’s not just an ordinary shop where you buy an item and then that’s it, transaction complete. They offer 18 months warranty extension to their bags. And if for some reason you want to return the product, they have a 60-day free return shipping term, meaning they will pay for the return shipping fee 60 days from your date of purchase. I think that’s not a bad deal at all. Now back to our topic, the packing cubes come in a set of 6 of different sizes: 2 large cubes (17.5″ x 13.7″ x 4″) 2 pieces of medium cubes (13.7″ x 9.8″ x 4″), and another 2 slim cubes (13.7″x5″x4″). There are 8 color options, such as black, purple, pink, blue, dark blue, burgundy, fuchsia, and gray. All these for only USD 29.99 (PHP 1482.86). I know there are packing cubes you can get for less, but people, we want durability here. We’re talking about something that we could carry when we travel so we want to make it of high quality. 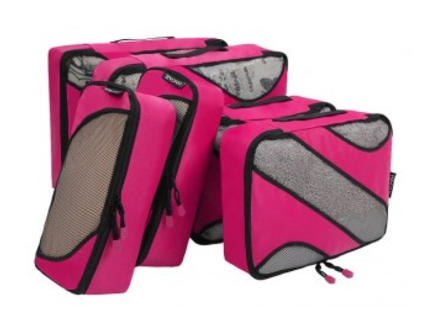 Bagail packing cubes are made with high-quality fabric with finished interior seams for durability. Were the packing cubes useful? Hell yeah, it is. It did help packing easier and much more fun (I’m a little bit OC so yeah, I consider this fun). It made organizing far easier than using the small pouches and zip locks. I know exactly where I put my items with the mesh on the cover allowing me a peek inside the cubes. It helps that I also like the aesthetic part of it; it looks good that the cubes have a uniform look. There’s a cube for my clothes, cube for my toiletries, cube for my delicates, cube for my laundry, cube for my electronic devices and cables, and cube for cosmetic and other girly stuff. And I have no trouble stacking these cubes inside my bag. As a frequent traveler, I’ve learned the art of cramming everything into a small space; every nook and cranny of my bag used to their full potential. But when you travel often, you gotta find ways to do things efficiently. In this case, Bagail packing cubes helped me solve my constant dilemma of figuring out how to put things inside my bag in a systematic way. To put it simply, my packing ritual has become much more interesting than it already is. What about you? What do you use to make packing for a trip easy and organized? For me, it’s my rucksack. We don’t have such cute looking cubes in the market as of now. Who knows, we may all be ogling at this product in a few months from now. Do these products always come in pink color? I want one! I want one! Packing cubes are now the next big thing. Will check out their website and maybe I would buy a cube or two! I love packing cubes. They keep us so organized during the travel and help us save so much time. Ok, the one part of my travel I don’t like is Packing. I was quite amused when you said that you do! For me I always have this feeling of …did I leave something behind1 and I sure have not yet come to terms with it. Yes, I love packing, I don’t know why! Maybe because it amps up my excitement for the trip ahead. In my case, they do fit inside my backpack pretty well. And I love that my stuff don’t get messed up inside the bag. Wow I seriously need to buy myself these packing cubes. I absolutely hate when my clothes and other stuff get all messed up in my suitcase. These would be really helpful! You really should try these, they are very useful. Packing cubes or sourcing them from my destination are always on my mind while planning a trip. Thank you for the product review and a few helpful pointers! This is an interesting concept. Would work great for toiletries and similar stuff. Don’t the clothes crumple in these cubes ? This would work fabulously for the lazy packer in me, who does any packing at the nth minute ! The clothes do get crumpled, it cannot be helped. What I do is, as much as possible I bring clothes that don’t get easily wrinkled.